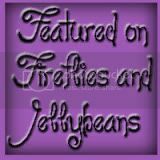 Fireflies and Jellybeans: Sunday Spotlight: SOYS # 30 Favorites! Thanks for the double feature Fawnda:) And congrats on 137 links!! I'm so tickled that you chose to feature my bean bags! Thank you for providing us with this forum to share our "stuff" and thanks for taking the time to visit each link! There are so many great ideas out there! Thanks for featuring ours. We love making new blog friends. Great features. Love the title of your blog. Isn't blogging interesting, especially when on has time to go out and visit.